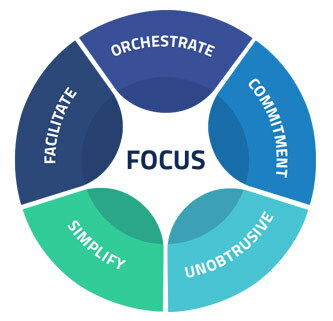 At xFact we approach each engagement with our “FOCUS” Methodology. Our FOCUS methodology creates results for clients by using effective, transparent, and innovative ideas. Play the role of a facilitator and not a creator; help develop and leverage the vision of the client. Coordinate and present stakeholders' ideas in an organized and seamless manner, building on the core competencies of the client. Provide unwavering commitment during the lifecycle of a project. Execute projects in a cooperative and unobtrusive manner. Reduce complex ideas and activities into small, simple tasks.